Gloria: I think I know how I feel. Francis: I'm not so sure you d-do. I'm not so sure anyone who c-calls themselves a-a vegetarian real-really knows how they feel. Deep down I think they're-they're the most ca-carnivorous of us all. They just d-d-deny it harder. They're the ones who feel like they have to p-p-parade their smug, s-self-righteous, s-sanctimonious, holier-than-thou attitude b-before the entire world every day of the p-p-pathetic m-miserable shams they call lives. For every bad movie, there's a good one within it waiting to be set free. No more is this apparent than in Buddy Boy, a low-budget mystery/thriller/horror from first time writer-director Mark Hanlon. The basic premise of the film is intriguing, centering around the awkward Francis (Aidan Gillen), who takes his binoculars to peep at the beautiful woman in the apartment building next door, Gloria (Emmanuelle Seigner). If the script was content with this storyline, one would have a slick thriller with plenty of room for suspense and surprises. Unfortunately, Hanlon throws many other subplots into the mix and the result is a confused, tiring mess. Francis lives with his stepmother (Susan Tyrell) in a rundown apartment. She is as wicked as they come, constantly putting Francis down and filling him such self-loathing that he reverts to masturbation even after Gloria attempts to strike up a relationship with him. Things are only complicated when a lazy plumber, Vic (Mark Boone Junior), befriends the stepmom and the two together only infuriate Francis further. Disillusioned, Francis begins to turn away from his Catholic faith and fears that God hates him. Meanwhile, following the main story, Francis finally caves to Gloria's advances. They begin to "fornicate" (his words) and the unlikely pair appears to be headed toward a happy ending until one night he sees the self-proclaimed vegan eating meat from his peephole. He can't find any leftovers in her apartment and she constantly denies a desire for meat. What could possibly be the explanation for this? The movie never decides whether it wants to emphasize Francis' relationship to his stepmother or to Gloria. Consequently, neither comes across as very interesting because its unraveling is constantly being interrupted by the other story. Susan Tyrell's performance as Francis' stepmom is unsatisfyingly cartoonish, making the whole subplot discomforting. The gloomy visuals don't help elevate the movie either. Hanlon is clearly an admirer of the great filmmakers, with his visual and story elements evoking Rear Window, Psycho, and practically every Polanski film ever made. But his constant reliance on their work only reminds me of these superior films. The character of Francis is practically a carbon copy of Norman Bates, right down to the stutter and nervous behavior. Emmanuelle Seigner is an alumnus of many Polanski films, but her natural ease in those movies is conspicuously absent here. 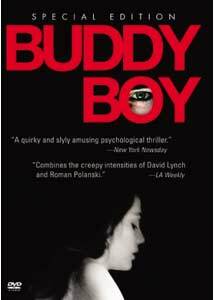 If it weren't for Graeme Revell's interesting score, Buddy Boy would probably be nothing but a rehash of better products. Yet, even though the movie never clicks, it always holds out the promise that everything will come together. There's a shocking twist that occurs halfway through the movie—when Francis is peeking in on Gloria—that left me amazed. Unfortunately, Hanlon constantly teases us with whether it is real or not, so that when we finally learn the truth, I no longer cared. If the movie ignored Francis' crisis of faith and the ghoulish nature of his family life, his relationship with Gloria could be truly fascinating. Aidan Gillen tries admirably to make Francis a unique and human character, but the constant pull between storylines undermines his efforts. Hanlon may redeem himself in future projects, but his problem here is a lack of focus or inventiveness. He strives to emulate Polanski and Hitchcock, among others, but lacks their vision. Maybe he needs to borrow Francis' binoculars. Image Transfer Review: The 1.85:1 anamorphic widescreen transfer is grainy at times, though I suspect that is attributable to the source material. Detail is fine and the colors come across nicely, though the blacks have very little texture to them. There's nothing very noteworthy about it. Audio Transfer Review: Despite having a DTS 5.1 mix, the audio is fairly timid. On both the DTS and Dolby Digital 5.1, the rear-channels are reserved almost exclusively for the score and only occasionally for sound effects. I didn't notice any directionality, nor did any sound separation leap out. Dialogue is crisp and audible, but these are front heavy mixes. There's also a Dolby Stereo 2.0 English mix. Interview with Director Mark Hanlon—a video interview with the director at the movie's world premiere. Extras Review: The special features kick off with an audio commentary by writer/director Mark Hanlon. He is well spoken and talks about the intentions with the visuals. His delivery is dry and none of the information about the production seems particularly interesting as a result. Additionally, much of the track is filled with silence. However, Interview with Director Mark Hanlon (04m:15s) is much more interesting, with Hanlon discussing his personal interest in the subject. Its quite brief, but actually conveys more information than the commentary. Additionally, the movie's theatrical trailer is shown in 1.33:1 full screen and is the basis for the main menu's design. Following that, Behind the Scenes: Set Construction (11m:01s) is a recording of the soundstage the production shot on. There's no narration and the footage is largely of empty sets, so the whole featurette seems rather aimless. There are storyboard drawings for two select scenes, though I won't tell you which ones due to plot secrecy, that play as a slideshow. Finally, there is also a collection of production stills that also play as a slideshow. That is the conclusion of extras available to everybody. However, for those with a DVD-ROM and Adobe Acrobat Reader, you can also read the Buddy Boy screenplay, a Preview Magazine article about the film, and various movie reviews. All in all, these special features are largely uninteresting. A disappointing movie that could have been good with a stronger sense of direction, Buddy Boy: Special Edition is a lackluster release. Its sound and image transfers are nothing exceptional, nor are the special features.